The Craft Barn Alpha/Dictionary challenge! Huge Credits to Just My Scrapping World.. Credits whose work has inspired med - maybe a little to much - sorry. Acrylic paint. Gesso. 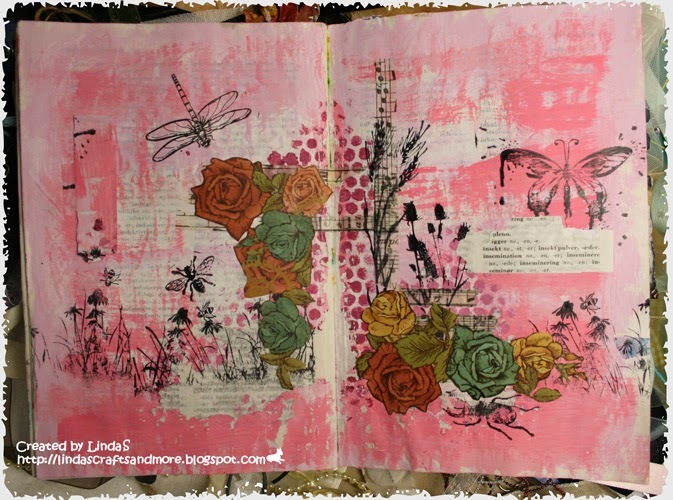 Stamps; Inkadinkado, Tim Holtz. Stencil. Wasi Tape. Prima PP/cut out. X was difficult but thought that acid must be in a bottle - to tricky or ... 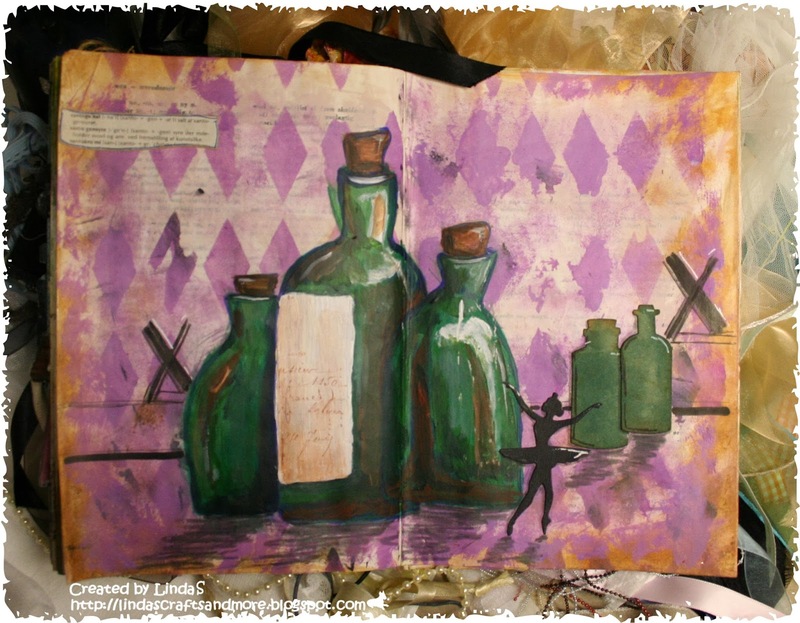 But I had fun drawing and painting the bottles. Stencil. Dies. Acrylic paint. Stamp: TH. I do like the composition of your insects and your x word is very clever. A little surreal, I think with the tiny dancer. The cover of your book is lovely. Hasn't this been fun? These are two fantastic pages. It's done! wow, beautiful last entries....and you made even the cover! I wish you a very happy festive season, Linda! I just love your cover!! Hasn't it been fun! Visiting from The Craft Barn - Excellent finale to this challenge. Great last two pages - love the flowers and insects. Have to say your cover looks stunning too - a great end to the year!! Gorgeous pages and your book cover looks great too. Wow what stunning pages Linda, I LOVE both of them. 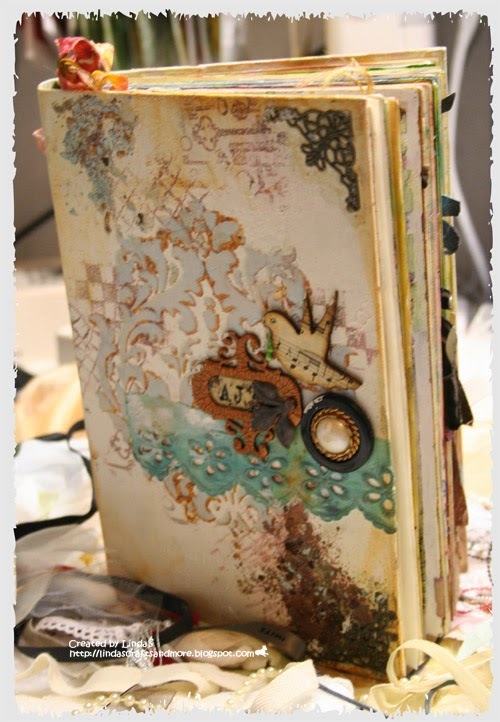 Your cover is so very beautiful too, the texture is amazing and I adore all the finishing touches. Lol I'm still waiting for glue to dry so that I can paint mine, I'm determined to get it linked before it all closes!!!!!!!! Thank-you so much for your sweet visit, much appreciated. Love the insect page and the bookcover looks great! Wonderful last two pages, love the pretty bug page and the bottles of acid are fabulous. Beautiful last two pages and stunning cover. Linda your I and X pages are fabulous and I think you, like me have come a long way on our creative journey. This challenge has encouraged us to develop our inner artist.LOL. Your cover is beautiful and the texture very yummy. Thank you for all your wonderful comments.